Our lovely consultant, Jennifer Chatburn visited the Tussen Ons team recently to discuss wigs and how they are fast becoming a staple in women’s (and even men’s) wardrobes. Watch the clip here. Fascinations Hair has a solution for all types of hair. They are Jon Renau South Africa and distribute wigs, toppers, extensions and all Jon Renau product ranges. You can visit www.wigs.co.za to view the full collection, book a private consultation or order online. Instantly turn on the heat with these gorgeous California inspired locks. Who says that it has to be Summertime to enjoy gorgeous Summer hair? Not many of us would give up the opportunity to embrace gorgeous Summer hair, right? 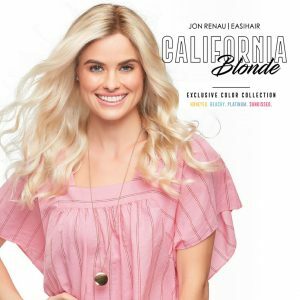 So let’s beat the Winter Blues and get our gorgeous on with Jon Renau’s hottest new California Blonde Collection. Be it platinum, honeyed or sunkissed locks that you are after, the collection has the perfect blonde for everyone! Wigs.co.za is the South African Jon Renau online store where you can browse and order your perfect wig or hairpiece in the comfort of your own home. If you prefer to try on the wigs, please make an appointment with our friendly and highly experienced style consultants in our salon. Wigs and extensions are fast becoming a must-have accessory in every woman’s (and some men too) wardrobe! Dressing up? Whip out that dazzling black wig to suit the little black dress! Going to a casual cocktail do? Pop on the blonde messy curls! Dress your mood in one easy step – just whip on your wig or hairpiece and voila! Celebs are doing it, people like you and me are doing it! Let’s do it! Gone are bad hair days forevermore!